The route I take to work is the last place I thought I'd ever find anything 'Barbie'. Alas, there it was at a bus stop ad! -In 1959, Barbie made her way into the world at a New York toy fair. 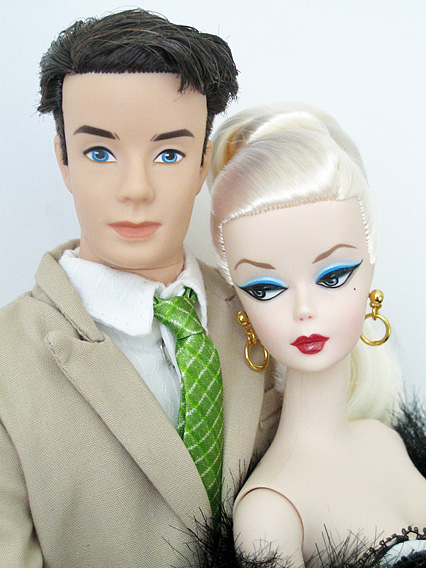 -In 1961, Barbie was joined by a shiny, new accessory....known to the world as her boyfriend, Ken. 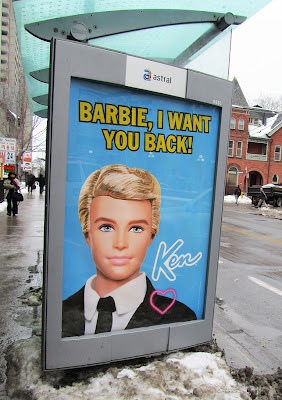 -In 2004, a day before Valentine's day, Barbie broke up with Ken, after 43 years of being together, to run off with an Australian dude named Blaine. Debut Silkstone Barbie with Fashion Insider Silkstone Ken. Fast-forward to now....It's 2011 and Ken is turning 50. Valentine's day is also just around the corner. Can it be that Mattel is stirring something up for a triumphant reunion of the ultimate plastic couple to celebrate Ken's milestone? I guess we just have to wait and see. nice. it'll be nice to follow the ads. Oh my god, that is hilarious Alrunia! It was kind of a given but very interesting indeed! I love the lipstick mark on Ken's cheek! Kory, I saw another ad somewhere with the same Ken poster but it says "Barbie, you're the only doll for me." Unfortunately I was in a moving bus at the time and without a camera.